If you're on the lookout for a casual yet stylish outfit, opt for a CeCe ruffle blouse from Nordstrom and navy shorts. Both items are totally comfy and will look fabulous paired together. For something more on the daring side to finish off this ensemble, make silver leather ballerina shoes your footwear choice. If you're on the hunt for a casual yet totally chic look, dress in a CeCe ruffle blouse and black skinny jeans. Both pieces are totally comfy and will look fabulous together. If you're on the hunt for a casual yet chic outfit, consider wearing a CeCe ruffle blouse and a multi colored vertical striped maxi skirt. Both items are totally comfy and will look fabulous paired together. You could perhaps get a little creative when it comes to footwear and dress up your look with black leather pumps. 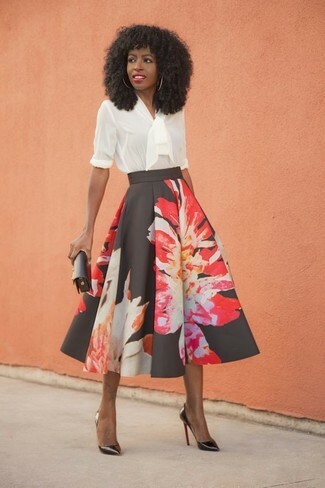 If you're searching for a casual yet totally stylish ensemble, pair a CeCe ruffle blouse from Nordstrom with a black floral full skirt. Both garments are totally comfy and will look fabulous paired together. Let's make a bit more effort now and throw in a pair of black leather pumps. If you're looking for a casual yet absolutely chic ensemble, wear a CeCe ruffle blouse with a blue denim mini skirt. Both pieces are totally comfy and will look fabulous together. When it comes to footwear, this outfit is finished off nicely with tan leather wedge sandals. For a casually elegant look, dress in a CeCe ruffle blouse and a black suit — these two pieces the workplace really well together. Black lace pumps work wonderfully well within this ensemble. 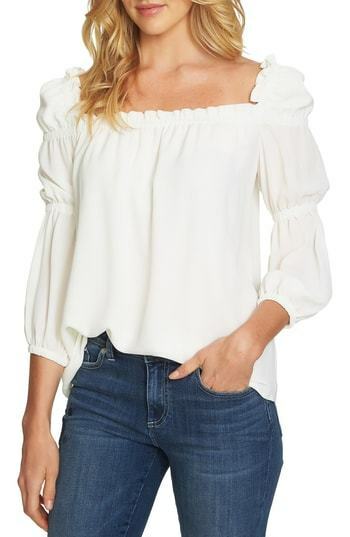 If you're searching for a casual yet absolutely chic look, rock a CeCe ruffle blouse with black fringe jeans. Both garments are totally comfy and will look fabulous paired together. Kick up the cool of your outfit by rounding it off with brown leopard suede pumps. This combo of a white ruffle long sleeve blouse and a pink pencil skirt is so easy to pull together without a second thought, helping you look amazing, chic and ready for anything without spending too much time combing through your arsenal. 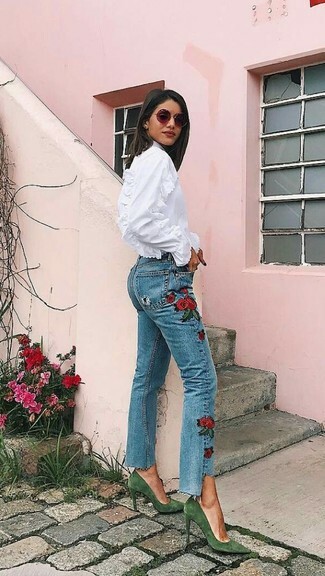 This combination of a CeCe ruffle blouse and blue embroidered jeans is effortless, stylish and very easy to imitate! You could perhaps get a little creative when it comes to footwear and spruce up your outfit with green suede pumps.